Before the new baby is born, Beryl calls it Babka, hoping it will be a girl as sweet as Mama’s delicious chocolate dessert. When it finally arrives, though, Beryl is disappointed. Not only is the baby another boy (she already has one little brother, Sam), but he has a stupid name and is just a big dumb lump, not the gorgeous genius the grownups say he is. However, her wise Uncle Morty has a few tricks up his sleeve. With a little magic and a little assistance from Mama, the aunts, and some old baby pictures, their Uncle Morty helps Beryl and Sam see that some things are true and unchanging, like the sun in the sky above and a family’s love. Sharp and witty illustrations from popular artist Victoria Chess punctuate this easy-to-read chapter book about a unique and loving family. Victoria Chess is the illustrator of Good Night Dinosaurs. She has also illustrated many other successful picture books for children, including the popular Slugs by David Greenberg (Little, Brown). She lives in Warren, Connecticut. 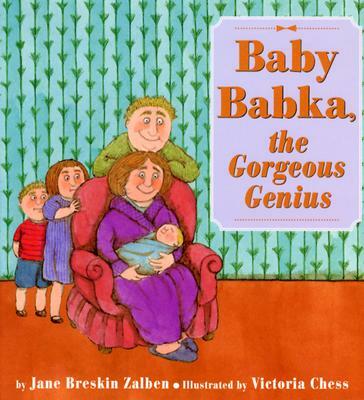 Jane Breskin Zalben has written and illustrated many distinctive picture books, including Pearl's Eight Days of Chanukah and the best-selling Beni holiday series. She is also a cookbook writer, the author of six novels for older readers, and a painter of abstract art. The mother of two grown sons, she lives on Long Island, New York, with her husband, Steven.